Last year, the Nielsen ratings for OWN’s Queen Sugar TV show dropped off some, but it still got the second highest demo ratings for scripted series on Oprah Winfrey Network. How will it do, this time around? Will Queen Sugar be cancelled or renewed for season four? Stay tuned. *Status update below. An OWN original drama from Ava DuVernay, Queen Sugar stars Rutina Wesley, Dawn-Lyen Gardner, Kofi Siriboe, Bianca Lawson, Tina Lifford, Ethan Hutchison, Omar J. Dorsey, Dondré Whitfield, Timon Kyle Durrett, and Henry G. Sanders. Based on the Natalie Baszile novel, the story unfolds in the fictional Louisiana town of Saint Josephine. It chronicles the lives and loves of the estranged Bordelon siblings who try to save the family sugarcane farm, after a family tragedy. For comparisons: The second season of Queen Sugar on OWN averaged a 0.42 rating in the 18-49 year old viewer demographic and an average total audience of 1.488 million viewers. What do you think? Do you like the Queen Sugar TV series? Should OWN cancel or renew this TV series for a fourth season? 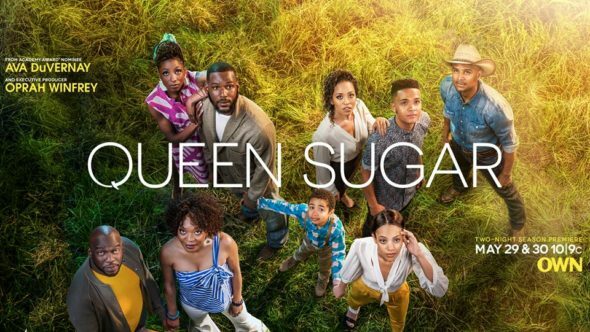 *8/8/18 update: OWN has renewed Queen Sugar for a fourth season. Details here. I love Queen Sugar! Can’t wait for Season 4! !!! I love the show but this Remy and Nova storyline I am not feeling (but it definitely has my group talking). I also love Hollywood and Aunt Vy as a positive black couple on TV so please dont mess them up. Also, can RalphAngel speak a little louder. He always sounds like he is whispering. Otherwise, a GREAT SHOW!!!!! i just got into it. i’m loving it. it’s complicated, complex and originally told. i hope they keep it going. Yes I absolutely love this show! I watch it on DVR most of the time so I can skip the commercials.